OC Inc. Posts in category: "prison phone"
Posts in category: "prison phone"
Sens. Duckworth, Booker, Portman, Schatz introduced today a finely crafted bill that will rightfully return to the FCC its authority to stop predatory prison phone rates across the country. "This bill is a much-needed remedy to an extremely detrimental court decision last year," said Cheryl A. Leanza, policy advisor to the United Church of Christ's media justice ministry, OC Inc., a primary backer of the bill. "Families, clergy and loved ones have been suffering for decades and the new legislation will restore power to the Federal Communications Commission to establish just and reasonable rates." After a decade of delay, between 2012 and 2016, the Federal Communications Commission began to address predatory rates to telephone people in prison, jail and detention centers. Over those years the FCC reigned in long distance rates to 21 and 25 cents per minute, capped local rates at the same levels with a few exceptions for smaller jails, and imposed limits on the egregious fees which accompany inmate calling. These rulings were viciously attacked in the courts. Inmate calling companies and a few states (led by then Oklahoma Attorney General Scott Pruitt) sued to stop the FCC's rules. Partially in response to an FCC that did not fully defend the rules, a federal appellate court blocked the rules and cramped the authority granted to the FCC. In one most egregious example, the court concluded that the term "fair" meant that rates should be fair to phone companies but need not be fair to consumers. Ms. Leanza explained, "the Inmate Technical Correction Act is a critical step to ensuring that previous efforts at the FCC are reestablished." FCC Chairman Pai and Commissioner Carr articulated the need for legislation in their confirmation hearing; Commissioners Clyburn and Rosenworcel are outspoken supporters of ending the abuse of consumers in this market. "The entire prison phone justice community owes a debt of gratitude to Senators Duckworth, Booker, Portman and Schatz for joining together and backing this legislation. 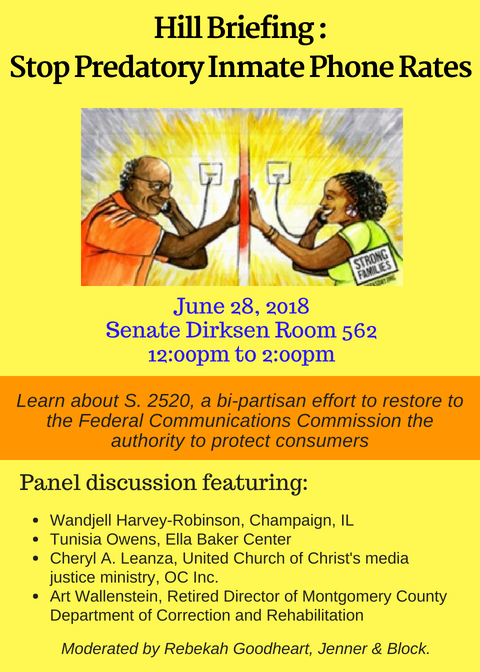 No one believes the inmate communications market is working, and this bill will put fairness to consumers back into the equation," said Cheryl A. Leanza, policy advisor for the United Church of Christ's media justice ministry, OC Inc. The saga of families and children seeking to maintain relationships with their loved ones in prison and jail has been on-going since early last decade. For every step forward toward more just treatment, affordable rates and fees, the prison phone industrial complex strikes back, demonstrating their chokehold on the service offerings for these people. The most recent actions by the Federal Communications Commission have failed these communities, leaving them in a market that all observers characterize as broken. Senator Duckworth's new legislation, S. 1614, the Video Visitation and Inmate Calling in Prisons Act of 2017, will eliminate any question regarding the Federal Communications Commission's authority to stop these practices and will address just uses of and charges for video calling services. Since the bi-partisan leadership of the Federal Communications Commission supports legislative efforts to cement the FCC's authority to act in this area, we urge the Senate Commerce Committee to quickly take up this bill. Today is another step toward justice in communications. For the last several years, advocates, clergy, people of faith and many others around our country have been campaigning to lower predatory prison phone rates. We in the United Church of Christ heard Jesus' call in Matthew 25 to remember and visit those in prison -- as Federal Communications Commission Chair Tom Wheeler said when he gave the Parker Lecture in 2014 "the way you see people in prison today is using communications." 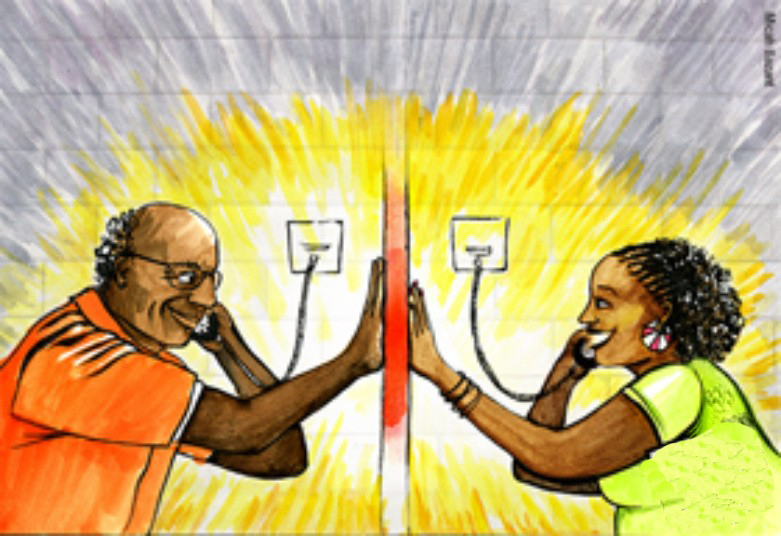 Our campaign asked the FCC to ensure that the families and friends of inmates are charged fair rates for phone calls. We spoke out asking the FCC to follow up with its ruling lowering long distance rates and address local rates also. Without this campaign prisons and jails were incentivized to set telephone rates because they received much of the profit from these calls. Grandmothers and ministers were subsidizing the cost of jail and prison from their own pockets. The good news is that the FCC heard us and adopted lower rates for local and long distance calls! Thanks to everyone, UCC's JPANet and Justice and Witness Ministries, our interfaith partners and everyone who helped with this successful campaign. Most of those new rules will go into effect today. Unfortunately, because the prison phone companies and a number of states have challenged the FCC's new rules in court, we will need to wait to fully benefit from the new rules until the law suit is over--probably not until 2017. As our policy advisor Cheryl Leanza said when the court acted, "Seemingly there is no limit to the lengths prison phone companies and sheriffs will go to keep their ill-gotten gains no matter the impact on these families, clergy, and lawyer-client communications." We have issued a guide to help families and people in prison and jail understand which rates become effective today and what happens next. While we wait for the law suit to end, it is important to keep the pressure on the states and prison phone companies that are fighting just and reasonable rates. Take action through the prison phone justice campaign, share messages on social media about these phone companies' greed and petition the state attorneys general that are thwarting prison phone justice with their legal action..